The Analytics Edge Basic Add-in makes it easy to download data to your workbook. Just select the cell where you want the results put, then open a connector query wizard. When you click Finish, the results are written into Excel. 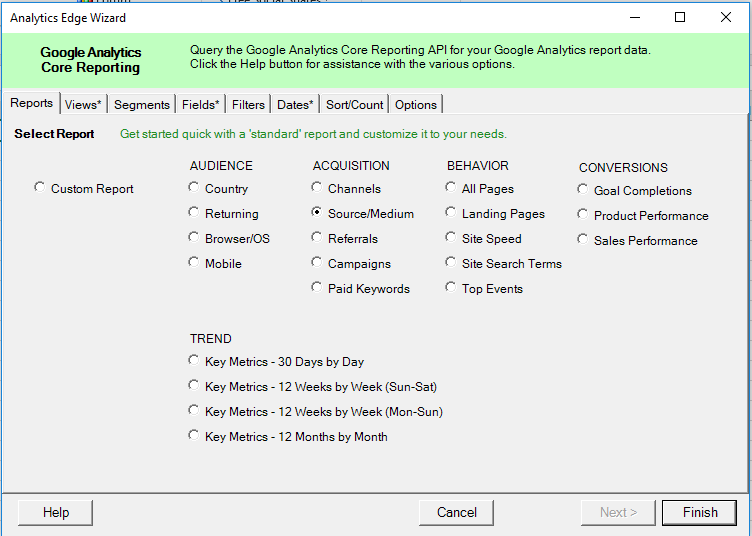 As an example, getting Source / Medium data from Google Analytics is a simple process: in Excel, on the Analytics Edge ribbon bar, click the Free Google Analytics connector button and select Analytics Reporting from the menu. When the query wizard opens, select the standard report for Source / Medium, and click the Finish button. Your data appears in Excel. Note the Excel comment (little red triangle) in the cell — this shows where the query was placed. To download more data, simply select another worksheet cell and repeat the process. You can use different reports, different accounts, and even different connectors. Just keep some empty rows and columns between the results so your queries don’t interfere with each other. This entry was posted in A. E. Basic Add-in on 2015/01/12 by functions.